In May 16, 2016, Hunan provincial government issued "the notice on Further Strengthening the application and management of building energy saving doors and windows", which made the energy saving doors and windows again into the people's field of vision. Doors and windows are used in all families, but few people are willing to pay attention to the energy saving function of doors and windows. It is considered that doors and windows are only the tools to cover the wind and rain, and they do not understand the role of doors and windows in building energy conservation. The data show that building energy consumption accounts for more than 40% of the total energy consumption of the whole society in the three energy consumption of the whole society, and the energy consumption of building through doors and windows accounts for nearly half of the total energy consumption of the building. Building energy saving, doors and windows are the key. But for a long time, due to social cognitive problems, this important field of energy conservation has long been neglected and marginalized. You may not know that reducing indoor heat loss in winter, blocking outdoor heat conduction indoors in summer, and maintaining indoor cooling effect, doors and windows play a key role. Compared with developed countries, China's energy-saving doors and windows industry is still in its infancy. At present, the proportion of high-performance energy-saving doors and windows in developed countries has reached 70% of the total number of doors and windows. 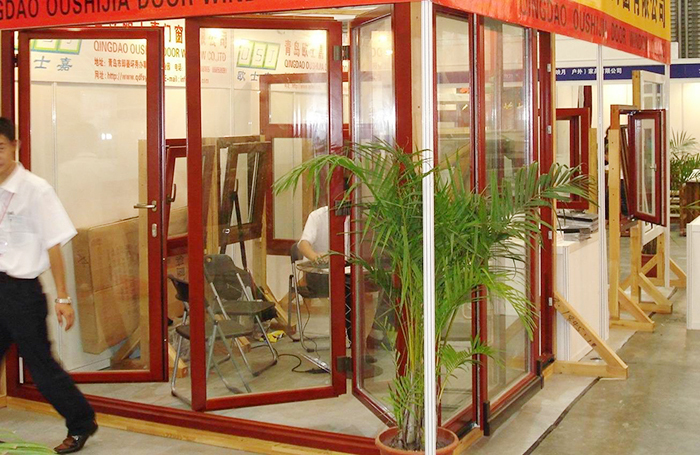 In China, the doors and windows of high-performance systems account for only 0.5% of the total windows and doors. According to the existing domestic building housing area of about 43 billion square meters, the doors and windows account for 25% of the building area, about 11 billion square meters of doors and windows. If the energy saving level reaches the current standard in Europe, it will save more than 4.2 million tons of coal per year, which is equivalent to 20% of the total coal output of our country. According to statistics, at present, there are more than 3 thousand home and window factories in China. The annual processing capacity of plastic doors and windows is 700 million square meters. The annual application amount is more than 450 million square meters, accounting for more than 50% of all kinds of building doors and windows. At the same time, the national annual production of glass 8 million 400 thousand tons (600 million square meters), of which 640 thousand tons of energy-saving coated glass (about 43 million square meters), accounting for 7.6%, 360 thousand tons of hollow glass (24 million square meters), accounting for 4.3%, the proportion is generally low. The existing windows and doors of our existing buildings are about 11 billion square meters. People in the industry estimate that if the energy saving level of these doors and windows reaches the current European standard, it can save 4.3 million tons of coal per year, equivalent to 20% of the total coal production in China. Energy saving doors and windows are windows and doors products that meet certain standards on the main physical properties such as air tightness, water tightness, sound insulation, heat preservation and heat insulation. The K value of thermal insulation coefficient (that is, the conduction coefficient of material, the greater the K value, the more heat transfer, and vice versa, the less the heat transfer) is one of the important indexes to measure the energy saving effect of doors and windows. At present, many cities in China will set the K value of doors and windows in 2 to 2.8, while the EU's existing energy-saving standards for windows and doors are K 1.1 to 1.3. It is such a value far below the European level. Only more than 30 thousand enterprises in China can produce their own doors and windows. The reason that most enterprises can't produce is that they are generally small in scale, backward in equipment, simple in technology, poor in the upgrading of products and technology, and lack of energy saving technology, especially in a complete set of energy saving systems. It is gratifying to say that the "building energy efficiency doors and windows is the key" statement, is now being recognized and valued by the local government. Recently, energy efficiency design standards promulgated by provinces such as Beijing, Shanghai and Jiangsu have further improved the performance standards of doors and windows. In the first passive architectural design standard promulgated by Hebei Province, the passive windows and doors popular in Europe have been used as standard reference products. The No. 146th document issued by Hunan points out that building doors and windows are the key parts of the energy saving of the outer enclosure structure, which plays an important role in improving the thermal environment of the building and improving the efficiency of energy saving. But in the past years, the special inspection of building energy conservation in the whole province has found that the new projects of civil buildings still have the behavior of making doors and windows of the raw materials such as the materials and hollow glass, such as the raw materials of the insulating glass, etc., which do not conform to the standard standards, and so on, which seriously affect the energy saving effect and the quality of the construction. Therefore, the notice will regulate three aspects: first, strengthen the cultivation and guidance of building energy-saving doors and windows production enterprises. The competent departments will strengthen the policy guidance and technical support, actively support the energy-saving doors and windows production enterprises in the region, and urge and assist the enterprises to declare the application catalogue of the popularization and application of the energy-saving technology, technology, materials and equipment of Hunan province (hereinafter referred to as the catalogue), and guide the construction industry to select the energy-saving doors and windows which are included in the catalogue. Two, strengthen the building energy efficiency doors and windows acceptance management. When building energy saving doors and windows come into the field, they should check the appearance quality inspection, specifications, models, technical parameters, product qualification certificates, product instructions, type inspection reports and so on, and form the corresponding acceptance records. Three, increase the intensity of sampling work for energy conservation projects of building doors and windows. We continue to carry out the inspection work in the new civil construction projects in the province, and take the energy saving doors and windows as one of the key objects, check the key links of the entry and exit inspection and reinspection of the energy-saving doors and windows, and test the important performance of the energy saving doors and windows. The final test results will be in the housing and city of Hunan province. The rural construction network and related media are publicized to the whole society. For the illegal use of doors and windows products, penalties will be punished according to the relevant provisions. Now, Shenzhen, Shanghai, Beijing and other places have begun to provide financial subsidies for the use of energy-saving doors and windows. In some areas, there is a subsidy for the renovation of existing doors and windows in the incentive policies for energy conservation of existing buildings. The outside doors and windows of buildings are the main objects of subdivision in the green building with low energy consumption in the future. Therefore, it can be predicted that energy saving doors and windows will be popularized and applied in our country. 上一页：Seize the opportunity and face the challenge, how can the villas industry play the leading role?